Narjes Haider, who handles Digital Marketing at Alosra, recently received a Winning Hearts award to show the team’s appreciation for all her hard work. “Narjes was initially not involved in a Fresh Food Revamp Project in Saar, as it is not her area of responsibility. Towards the last few days of meeting the deadline, she dropped everything and would lend a hand so that the deadline date could be achieved. She assisted me with creatives, from designs to copyright, and helped liaise with the relevant parties to ensure production and installation took place. More importantly she did so without even being asked for help. 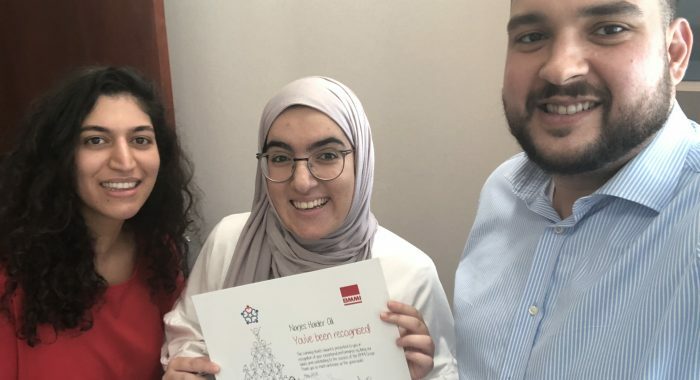 She is always willing to help her colleagues out, no matter how big or small the task, simultaneously delivering her own tasks in a timely manner,” proudly said Alosra’s Marketing Executive, Danya Alalaiwat. Customer Experience Manager, Pavlos Manousos, had plenty more praise to add. He mentioned how Narjes was coordinating the day-to-day of the department whilst a colleague was away. “She has just closed one year at Alosra with little experience from retail or large corporates. She has gone above and beyond her job scope to support operations, commercial and the department added to that she fully runs the Alosra Savers flyer which is a major initiative for the business and has been key to our success of increasing footfall. The significant progress we have made has been a major part of her effort and above and beyond approach to getting the job done. We are very lucky to have someone like her on the team,” said Pavlos. Narjes’s work ethic has proved to be beyond exemplary, embodying the perfect example of a team player. More importantly, she manages to deliver excellent quality of work every time and never fails to step in and take charge. Well done Narjes for being a great role model for what a BMMI employee should be!